Home › News and Reviews › John Hughes online is now available on mobile phones – What mobile browsing can offer car shoppers. 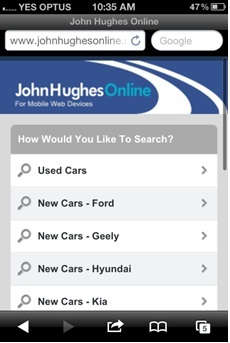 John Hughes online is now available on mobile phones – What mobile browsing can offer car shoppers. We’ve got exciting news this week – John Hughes has gone mobile! We’ve just launched our new mobile-friendly site, and now you can browse new and used cars online right from your handset. Compared to the desktop site, it’s easier to navigate on an iPhone or smartphone, quicker to load, and will still have all the information you need to shopping and browsing for a new or used car for sale. You’ll also be able to make service bookings, enquire about car parts, contact John Hughes via email and phone, and view Google map directions to various dealership locations. Over the past few years, we’ve seen a huge explosion of mobile internet usage statistics. Mobile sites, mobile apps, mobile shopping – it’s all happening. Between 2007 and 2010 alone, there was a 3000% increase in Australian mobile internet usage, and by next year, it’s estimated that more mobile internet searches will be done on mobiles than on desktops. With these huge statistics and trends around mobile sites, why is it that so many people are turning to mobile to browse online? There are a number of different reasons, the most obvious being convenience – you take your mobile with you everywhere you go, and since most people have smartphones with internet browsing capabilities, this means you’ve got your own little search tool right in your pocket. For those who happen to be in the market for a new car, this is especially handy for comparing prices and car models on the go. Indeed, according to Google thinkmobile, 79 percent of smartphone users do use their smartphones to help them when they’re shopping. Having a mobile-compatible site is also handy for when you’re on the road and need to find a phone number or directions to a certain dealership, so there are plenty of reasons to go mobile. Simply visit www.johnhughesonline.mobi on your phone to test out the new John Hughes mobile site for yourself today. How do you use your mobile to help you when you’re in the market for a new car or other large purchase?